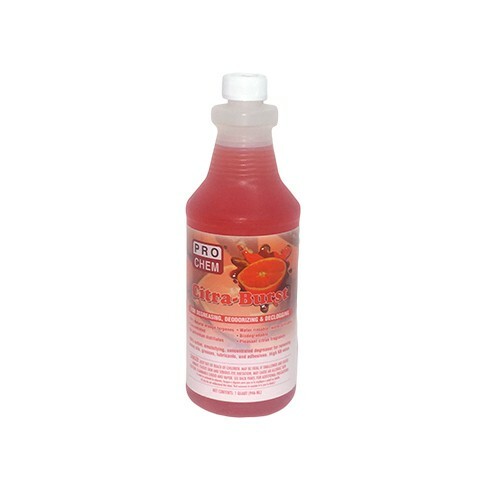 Citra-Burst | Pro Chem, Inc.
CITRA-BURST is formulated from citrus products and is perfect for a wide variety of uses including drain maintenance and odor control. It will keep drains flowing and grease traps clean and odor free. You can dilute it with either water or petroleum distillates for powerful grease-cutting action with a multitude of applications. With an FPA rating of C1, it can be used for drain/sewer maintenance in federal meat, poultry, egg shell grading and egg product inspection programs where there is no possibility of food contact. Odor Control: Dilute 1 oz. concentrate into 1 gallon of cold water. Spray directly to odor source or to control atmospheric malodors spray upward into the air. Cleaning & Degreasing: Dilute 3 oz. to 4 oz. concentrate per gallon of water. Apply directly to surface. Let stand two to four minutes before rinsing with clear water. Drain Maintenance: Add 3 oz. to 4 oz. concentrate to each drain. Let stand 5 to 10 minutes. Flush with hot tap water. Grease Traps: Pour 5 oz. of concentrate daily into traps under 20 ft. capacity. Large traps use 8 oz. to 10 oz. Excellent deodorizing. NOTE: Do not use clay-type absorbent materials to recover spills. Do not mix with acids or oxidizers.